This register state does not store any values. Read operations always return (new) undefined values. Definition at line 135 of file NullSemantics2.h. The protoval argument must be a non-null pointer to a semantic value which will be used only to create additional instances of the value via its virtual constructors. The prototypical value is normally of the same type for all parts of a semantic analysis. 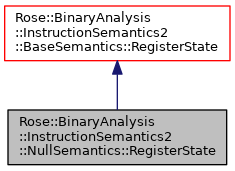 The register state must be compatible with the rest of the binary analysis objects in use. Definition at line 148 of file NullSemantics2.h. Definition at line 153 of file NullSemantics2.h. Definition at line 163 of file NullSemantics2.h. Depending on the register state implementation, this could either store new, distinct undefined values in each register, or it could simply erase all information about stored values leaving the register state truly empty. For instance RegisterStateGeneric, which uses variable length arrays to store information about a dynamically changing set of registers, clears its arrays to zero length. Register states can also be initialized by clearing them or by explicitly writing new values into each desired register (or both). See RegisterStateGeneric::initialize_nonoverlapping for one way to initialize that register state. Definition at line 167 of file NullSemantics2.h. Definition at line 168 of file NullSemantics2.h. The register descriptor, reg, not only describes which register, but also which bits of that register (e.g., "al", "ah", "ax", "eax", and "rax" are all the same hardware register on an amd64, but refer to different parts of that register). The RISC operations are provided so that they can be used to extract the correct bits from a wider hardware register if necessary. The dflt value is written into the register state if the register was not defined in the state. By doing this, a subsequent read of the same register will return the same value. Some register states cannot distinguish between a register that was never accessed and a register that was only read, in which case dflt is not used since all registers are already initialized. See RiscOperators::readRegister for more details. Definition at line 171 of file NullSemantics2.h. This is similar to readRegister except it doesn't modify the register state in any way. Definition at line 177 of file NullSemantics2.h. The register descriptor, reg, not only describes which register, but also which bits of that register (e.g., "al", "ah", "ax", "eax", and "rax" are all the same hardware register on an amd64, but refer to different parts of that register). The RISC operations are provided so that they can be used to insert the value bits into a wider the hardware register if necessary. See RiscOperators::readRegister for more details. Definition at line 182 of file NullSemantics2.h. This emits one line per register and contains the register name and its value. Definition at line 185 of file NullSemantics2.h.